Elfed Morris, one of the members of the “Famous Five” Chester forward line has sadly died at the age of 71. In 52 league and cup games during the 1964/65 season Elfed, along with Jimmy Humes, Mike Metcalf, Hugh Ryden and Gary Talbot scored 138 of the team’s 141 goals. Elfed was the outside left in this prolific line-up and contributed 26 of the record-breaking total as all five players passed the 20 goal mark. Elfed’s total of 69 Football League goals places him fourth in the list of all-time Chester scorers and is the highest total for a winger. Elfed started his football career with his hometown club, Colwyn Bay, where some impressive performances attracted the attention of Crystal Palace who offered him a three month trial. Although he failed to win a contract with the London club he signed as a professional for Wrexham in May 1960 after scoring four goals in his first reserve team match for the Welshmen. The tall winger made his Football League debut for Wrexham, at Millwall, in March 1961 but after only 9 league appearances moved to Sealand Road during the summer of 1962 for £750. After featuring for the Cheshire County League team, Elfed made his Chester debut in a 1-0 home win over Rochdale in April 1963. He scored his first goals for the club later the same month, netting twice in a 3-0 victory at Hartlepools. 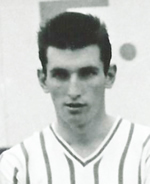 The following season Elfed scored eight times in 24 league games but his career took off in 1964 when he firmly established himself at outside left over Stan Bennion and Garth Lee. Throughout the 1964/65 season the “Famous Five” forward line terrorised Division Four defences but this commitment to attacking football came at a cost as an exposed backline meant that goals were conceded as fast as they were scored and no real promotion challenge emerged. However it made for a thrilling campaign and amongst Elfed’s valuable contribution was a hat-trick in a 6-2 win over Aldershot and one of the goals in a 6-1 win over arch-rivals Wrexham. He was also a member of the team that was narrowly beaten 2-1 by Manchester United at Old Trafford in the FA Cup Third Round. Elfed’s form attracted the attention of a number of clubs including Sheffield United and Birmingham City but he remained at Sealand Road where he received a call-up to the Wales Under-23 squad the following year. Although he failed to make the final Welsh team he ended the 1965/66 campaign as leading goalscorer at Chester with 24 league goals and won a Welsh Cup runners-up medal after Peter Hauser’s team were beaten in the final by Swansea Town. As Chester’s fortunes faded over the next two seasons Elfed struggled to maintain his goalscoring form and after Hauser was sacked in February 1968 he was allowed to sign for Halifax Town the following month. His stay at the Shay was brief and after returning to North Wales he was appointed player-manager at Caernarvon Town and also went on to play for Bethesda Athletic, Llandudno Borough, and Colwyn Bay. Elfed also managed Colwyn Bay in the 1970s and remained closely involved with his hometown club where he later acted as groundsman. Away from football Elfed was a keen bowler and took a keen interest in the exploits of the reformed Chester FC. One of his last visit’s to the Deva Stadium came two years ago when the “Famous Five” were reunited for the final time before the game against Bamber Bridge (pictured below, Elfed on the left). Everyone at Chester FC send out their deepest condolences to Elfed’s family and friends. 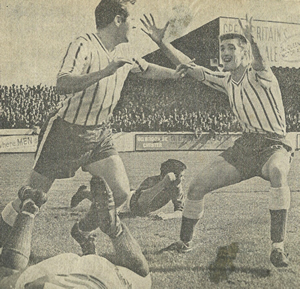 The picture above shows Elfed (on right) celebrating Les Jones scoring in the 4-2 win over Wrexham in 1965/66.